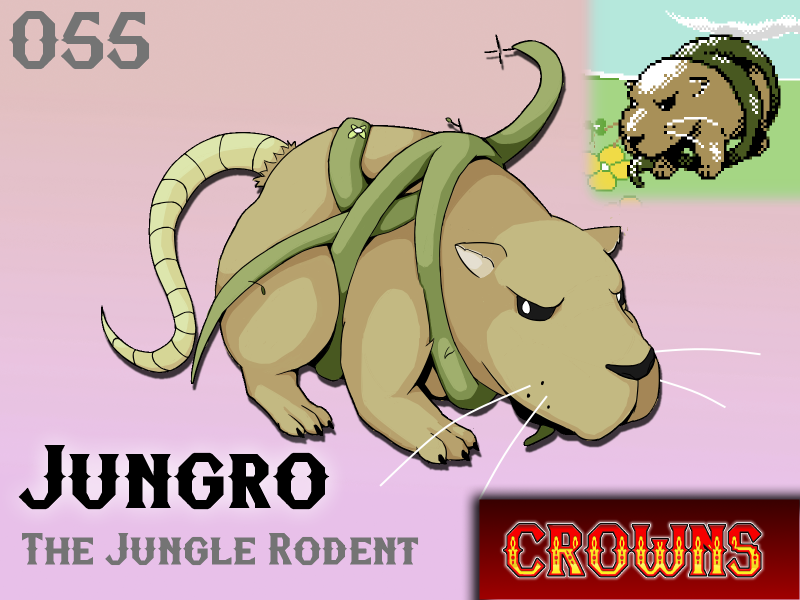 Jungro is a sturdy, giant rodent that protects its environment with amazing loyalty. It is said that there was once a small forest rodent that sensed the presence of a predator near its nest. Out of dedication to its young, it attracted the attention of the predator and ran, seeking to lead the foe far away from the nest. When the predator finally cornered the rodent, and the end drew near, a large tree fell to the forest floor, crushing the predator. Recognizing the protection of the forest, the mother began to pray. It swore to protect the forest that had protected it. The magic of the forest swelled, causing a thick vine to wrap around the critter as it grew to many times its original size. The newly empowered rodent became the first Jungro, walking the forest paths and whipping predators using the sharp vines that now grew from its body. Will Jungro make your team?